Both angiosperms and gymnosperms are seed bearing land plants. Gymnosperm plants evolved about 200 million years before Angiosperm plants. Therefore, angiosperms are considered to be more advanced plant group than gymnosperms.The main difference between Angiosperm and Gymnosperm is that the diversity of angiosperms is greater than that of the gymnosperms; this indicates the high adaptability of angiosperm to terrestrial ecosystems. Both angiosperm and gymnosperm plants are heterosporous, produce two types of spores as microspores and megaspores. One of the conspicuous features of angiosperms is the formation of flower, which cannot be seen in gymnosperms. Flower is a modified shoot which carry modified micro and megasporophylls. In gymnosperms, microsporophylls are connected together to form male cones (strobile), and megasporophylls are connected together to form female cones. The other main feature is the production of fruits by angiosperm. Ovules later converted to seeds in both groups. However, in angiosperms ovules are enclosed by an ovary wall that is later converted to fruit. In gymnosperms, seeds are not enclosed in a fruit (naked) and, therefore, ovules are directly borne on megasporophylls. The name angiosperm (greek angion, container) denotes the seeds content in fruits or mature ovaries. These plants bear flowers, a special structure carrying reproductive organs and fruits, ovaries that contain mature ovules. All angiosperms are included in one phylum known as Anthophyta (Anthos in greek – flower). Today Anthophyta are the most diverse and widespread plant group on earth, with more than 250,000 species. Further, these species fall into two large categories, the monocots and dicots. The basic differentiation between these two groups lies in the cotyledon. Plants which have one cotyledon are monocots while plants with two cotyledons are dicots. Even these two groups have differences in their flower structure and leave. Scientists suggest that angiosperms evolved about 140 million years ago, during the late Mesozoic period. By mid-Cretaceous period (about 100 million years ago), they began to dominate the terrestrial ecosystems. Flower is a specialized shoot that carries modified sporophylls, sepals, petals, stamens, and carpels. Carpel is the term used for the collection of the ovary, style, and stigma. Carpel is formed from the modification of megasporophyll. Microsporophylls are modified to form stamens. Petals and sepals are modified shoot parts which are used to attract pollinators. Microspores or pollen arise inside the anthers. Fruit is the mature ovary. There are two types of fruits; dry (when the ovary wall or pericarp is dry) e.g. rice and fleshy (when the ovary wall or pericarp is fleshy) e.g. apple. These dry or fleshy fruits again categorize into simple fruits, aggregate fruits, and multiple fruits. There are three major layers of a fruit wall or ovary wall. Exocarp or epicarp, the outermost layer arise from ovary wall. The middle layer is mesocarp, and the innermost layer is endocarp. Gymnosperms are the other type of land plants that bear seeds. However, gymnosperm seeds arise directly on sporophylls (naked seeds) without covering from an ovary, unlike angiosperms. Seed-bearing sporophylls form cones (strobili). Usually, cones are of two types as male cones bearing microspores and female cones bearing megaspores. 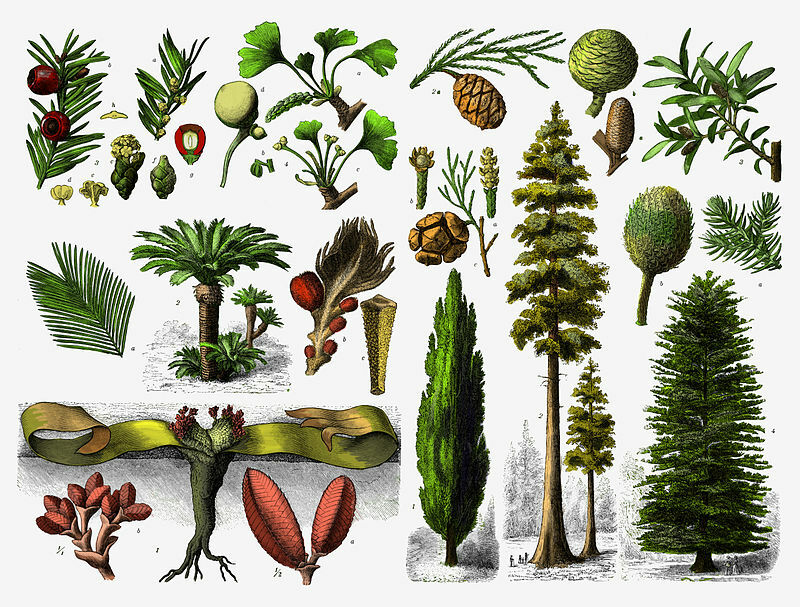 The earliest fossil of gymnosperms is about 305 million-year-old. Scientists suggest that the end of the Permian period (251 million years ago) gymnosperms became the dominant plants in terrestrial ecosystems. The largest group of conifers consisting about 600 species. Second largest group of conifers. Bear large cones and palm-like leaves. Ginkgo biloba is the only surviving species of this phylum. Bear deciduous fanlike leaves. This phylum consists of three genera: Gnetum, Ephedra, and Welwitschia. There are species in tropical and desert climates. Angiosperm evolved recently, about 140 million years ago. Gymnosperm evolved earlier than angiosperms, about 305 million years ago. Angiosperms are advanced land plants. Gymnosperms are primitive compared to angiosperms. About 250,000 species of Angiosperm are recorded. About Gymnosperm 720 species recorded. In Angiosperms, reproductive structures are born in a special structure called, flower. In Angiosperm, modified sporophylls are found as flowers parts. In Gymnosperm, sporophylls form separate structures as strobili or cones. In Angiosperm, flowers usually contain both stamens and carpels. However, there are staminate and pistillate flowers in the same tree or different trees. In Gymnosperm, cones are of two types, staminate or male cones and ovulate cones or female cones. Can be in one plant or two plants. In Angiosperm, ovules are covered by an ovary or ovaries. In Gymnosperm, ovules are borne directly on megasprophylls. In Angiosperm, pollens are found in anthers of the flower. In Gymnosperm, pollens are found in microsporangia on strobili. In Angiosperm, ovaries convert to fruits that contain seeds. In Gymnosperm, seeds are naked, no fruits present. In Angiosperm, carples are present; a collection of ovary, style, stigma. In Angiosperm, pollens are received by stigma. In Gymnosperm, pollen is received directly by ovule opening, micropyle. In Angiosperm, animal pollination is common. Gymnosperms are mostly wind pollinated. In Angiosperm, pollens can vary, wind pollinated pollens are smooth walled and light in weight. In Gymnosperm, mature pollen grain consists of three cells, one tube cell, and two sperm cells. 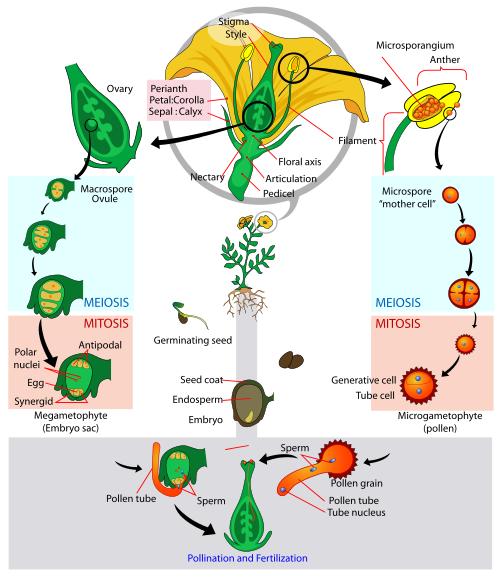 In Angiosperm, mature pollen grain consist of two sperm nuclei. In Angiosperm, there are no archegonia in mature megagametophyte. In Gymnosperm, archegonia are present in the mature gametophyte. In Angiosperm, embryo sac of a mature megagametophyte consists of 7 cells, with a total of eight nuclei. In Gymnosperm, a mature gametophyte contains 2-3 archegonia which contain a large egg nucleus. In Angiosperm, double fertilization occurs; zygote formation (2n) and endosperm formation (3n). In Gymnosperm, one fertilization occurs in the ovules; formation of zygote (2n). All Angiosperms have vessels as major water transporting elements. Most Gymnosperms lack vessels for conducting water except for the phylum gnetophyta which has vessels. Angiosperms have companion cells in phloem tissue. Gymnosperm lacks companion cells in phloem tissue. Angiosperm fruits can be categorized as dry and fleshy. Gilbert SF. Developmental Biology. 6th edition. Sunderland (MA): Sinauer Associates; 2000. Gamete Production in Angiosperms. Available here.